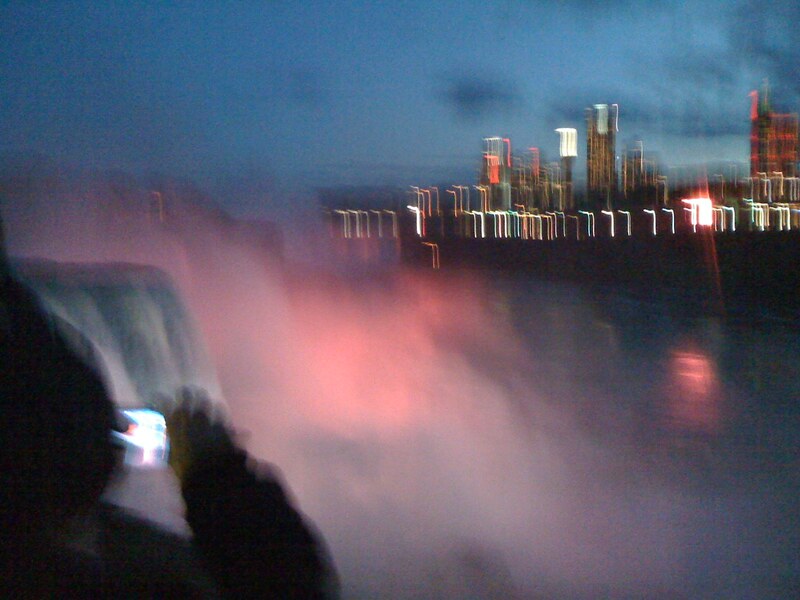 As one approaches Niagara a hum can be felt in the ears and it keeps growing louder and louder. 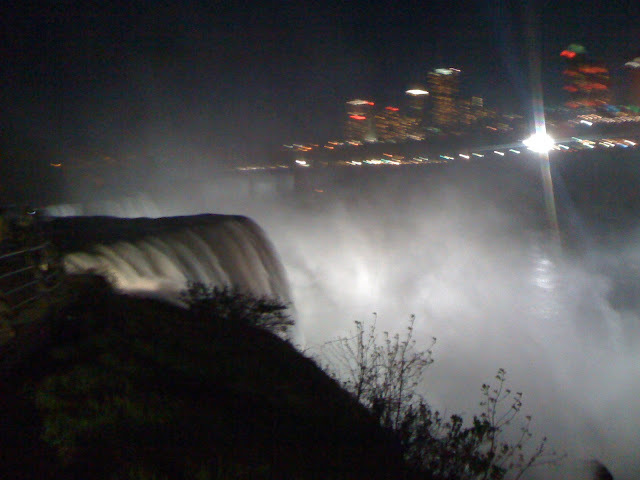 It is the sound of the falls audible from 10 KMs away and grows louder by the minute.The sound is omnipresent and can be heard all the time and all over the city. We were driving along the Niagara river and the flow was faster than I have ever seen anywhere.After checking into the Hotel Crowne Plaza (an excellent Hotel in Niagara Falls) we decided to walk to the fall. It was easy.Just walk towards the roar. 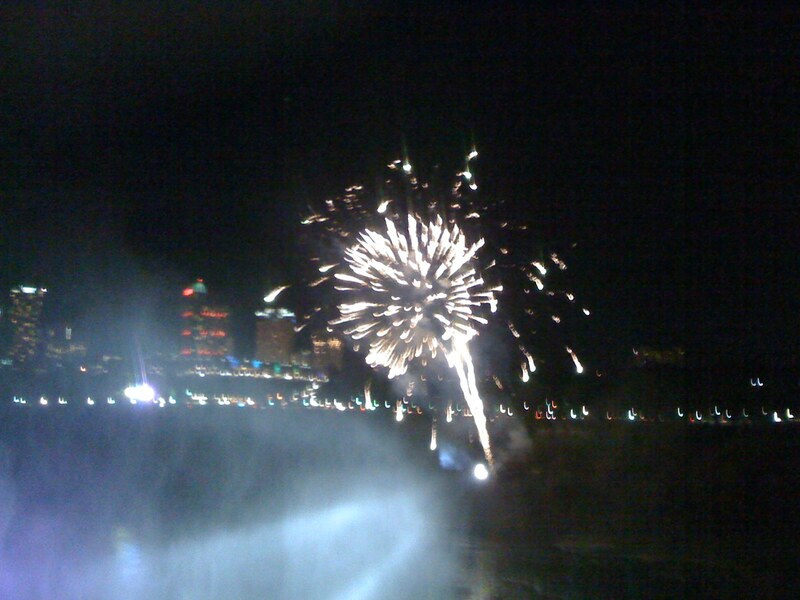 It was evening and the falls were lit up in various colours with lights from the Canadian side in changing colors. 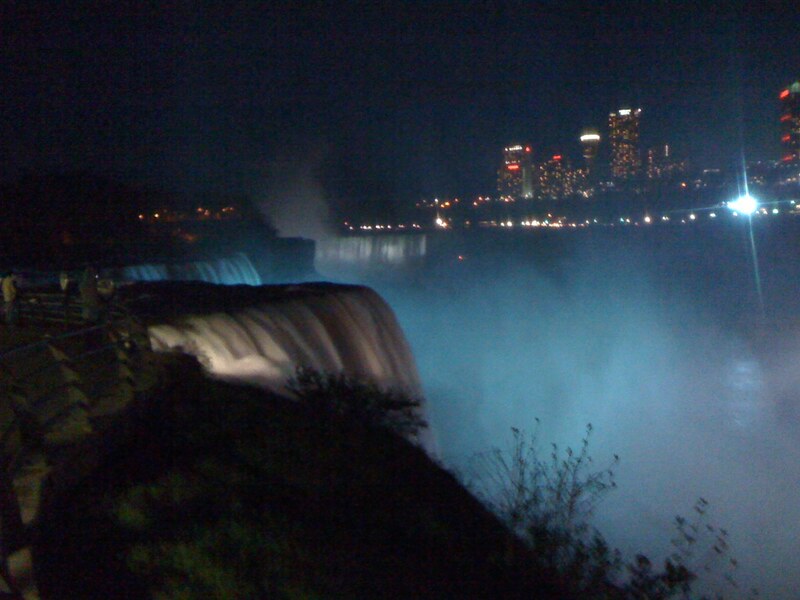 The colour of the lights was changing from Red to Blue to White at 3 or 4 minutes intervals. The wind was strong and the temperature was low ,and being inappropriately dressed we were getting chilled to the bones, and literally. The wind can bite through the clothes and the flesh to chill the bones. I think that is why we have a wind chill factor in weather forecasts. All of a sudden the fire works started and the sky was filled with exploding lights again in 3 colours, White, Red and Blue. It was an indeed spectacular sight with falls flooded with colored lights and exploding fireworks above.The show lasted about an hour and a half and despite the cold there was a sizeable crowd of tourists for whom the show was put up everyday during the tourist season. There was a restaurant close by where one could have dinner and also get some respite from the biting cold wind.It was almost mid night when we went back to the Crowne Plaza for a good nights sleep. Early next day we booked a tour that was going to take us around the Niagara City, The Falls and the Maid of the Mist ride. We were given yellow PE Parkas and water proof shoes at the very beginning,having to carry our own shoes in hand. 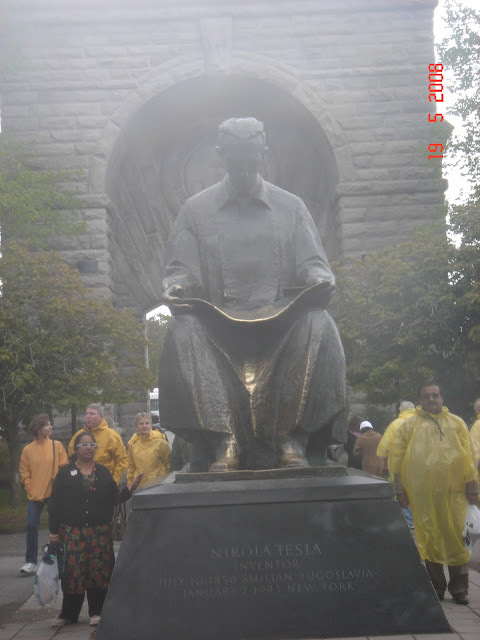 The first stop was a memorial of Nikola Tesla who designed and built the first Hydro electric Power Plant at Niagara Falls generating AC power. Uptil then Edison had been setting up DC Power plants. AC power can be generated in one place and transmitted over long distances using transmission lines. This was in fact the start of the electrification of the world and it has changed the way earth appears from outer space.The US is one of the very few countries where you can see memorials of engineers and scientists,and Tesla was from Yugoslavia. Normally it is the Rulers, Military Generals or Artists who have the good fortune of having memorials built after them. 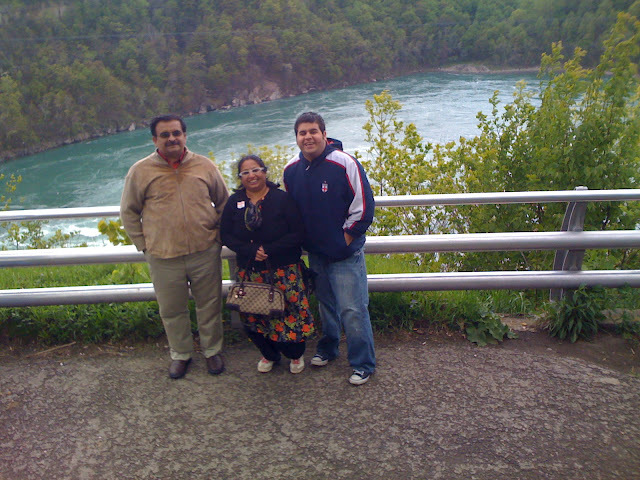 From the top of the falls- the bank of the Niagara river - we were transported by an elevator ,down 150 ft to the bottom of the fall. The stone that was dug out was used to construct the building in which the elevator was housed. The place was called Goat Island.It was fun getting wet in the water that was coming down. 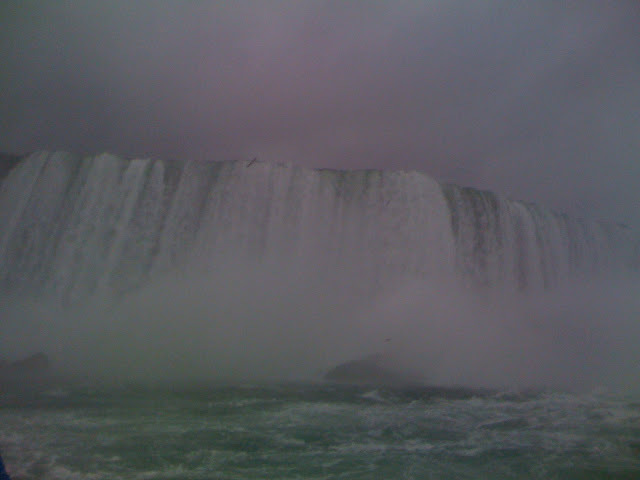 The spray was getting into the Sony camera and soon it stopped giving clear pictures and then we had to switch to the more resilient Steve Jobs Apple I Phone.The photographs became bigger in size,but lacked the sharpness and clarity of the Sony. 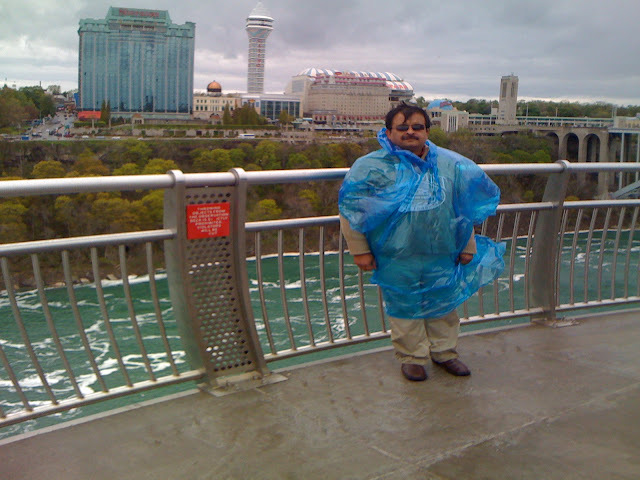 Anyways it was time for the Maid of the Mist ride and our yellow parkas were replaced with Blue ones,probably some kind of colour code for those who have been on the boat and those who have not. 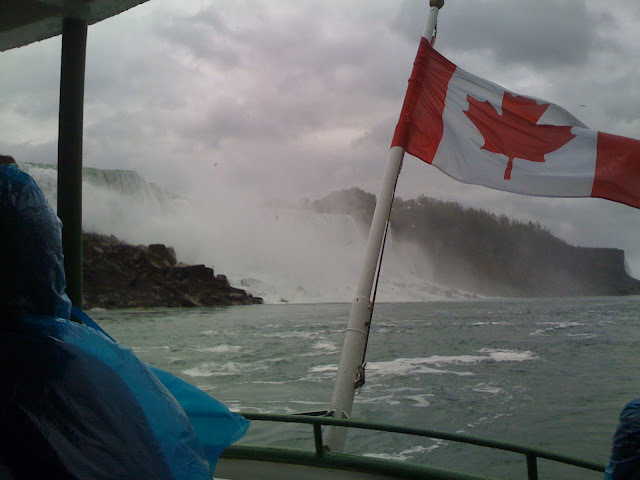 These are the smaller Bridal Veil falls which you pass on the boat. Uptil then it seems quite peaceful.The sea gulls are flying around looking for the fish which crash onto the rocks on the sides of the fall and provide a hearty meal for the birds. As you get closer to the actual falls the spray/mist starts appearing and the water starts getting rough. 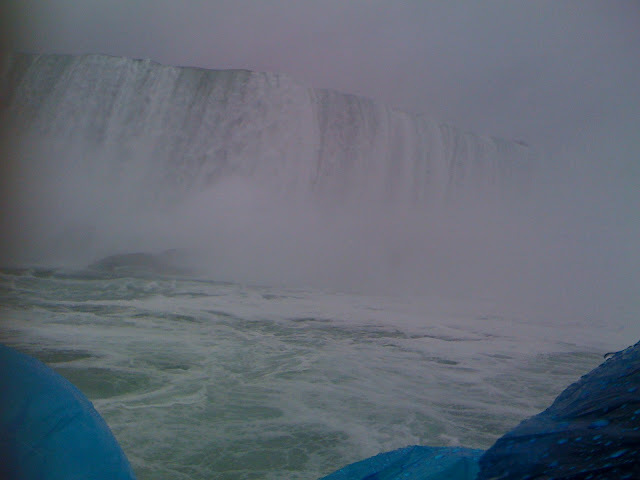 While passing through the Mist on its Maid, these are the distinct memories which stay with you for ever. 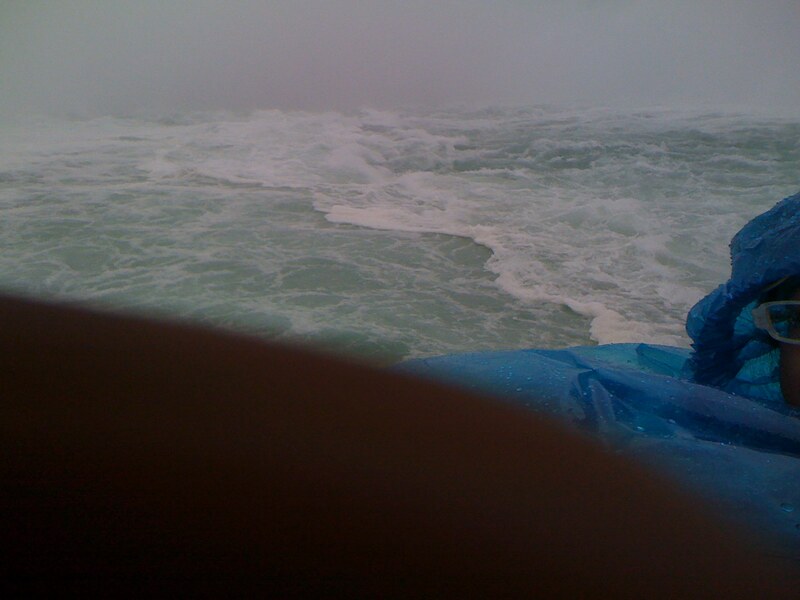 The boat is rocking almost a good 12 inches up and down forcing you to hold on firmly to something or the other. 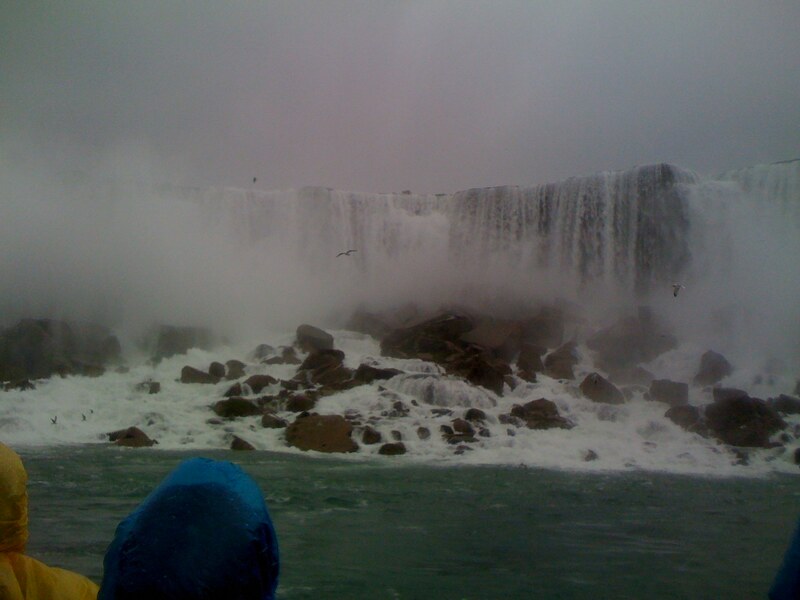 The deafening roar of the waterfall is pierced by the shrill screams of the sea gulls who are circling around you looking for fish which has not survived the water fall. 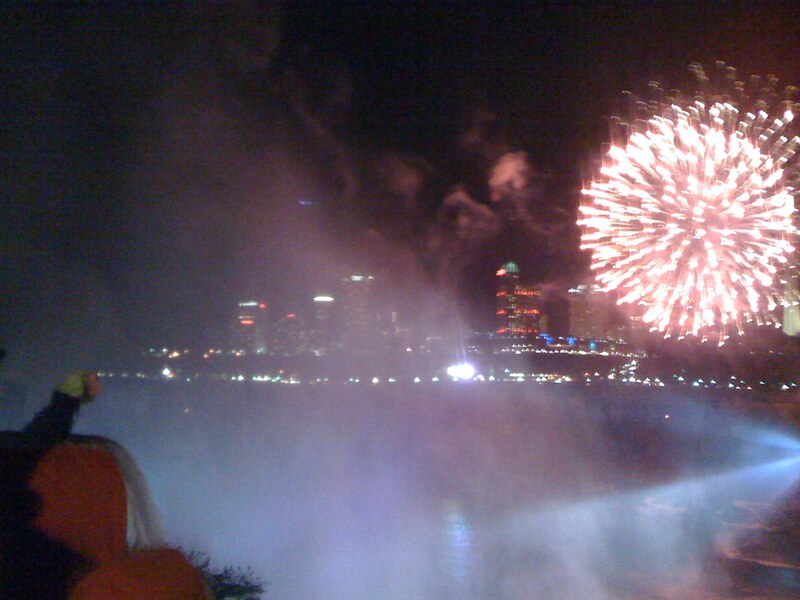 There is a fine mist/spray in the air which gets into your eyes,ears, clothes ,neck almost every where. There is a smell of fish all around. All of these add to the exihiliration of the ride and it is definitely one of the most thrilling experiences one can have. 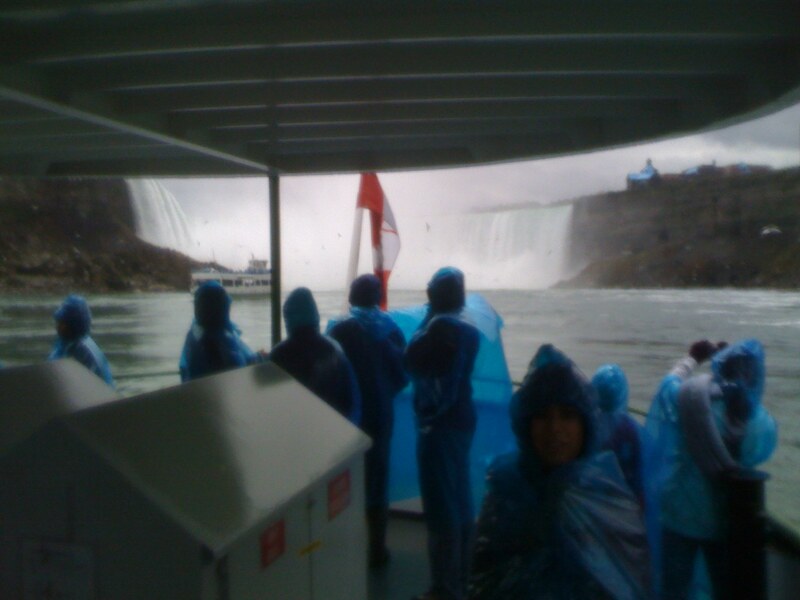 The Maid of the Mist turned around and headed back. 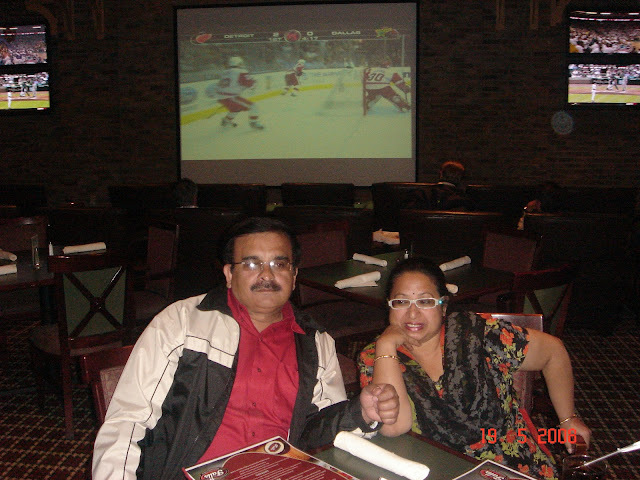 We visited a few more places in the city but they were too tame and simple compared to the Maid of the Mist ride and we headed back to the excellent sports bar of the Crowne Plaza and spent the evening watching some ice hockey match ,live on TV. From the groans and the cheering all around it appeared to be some important match. 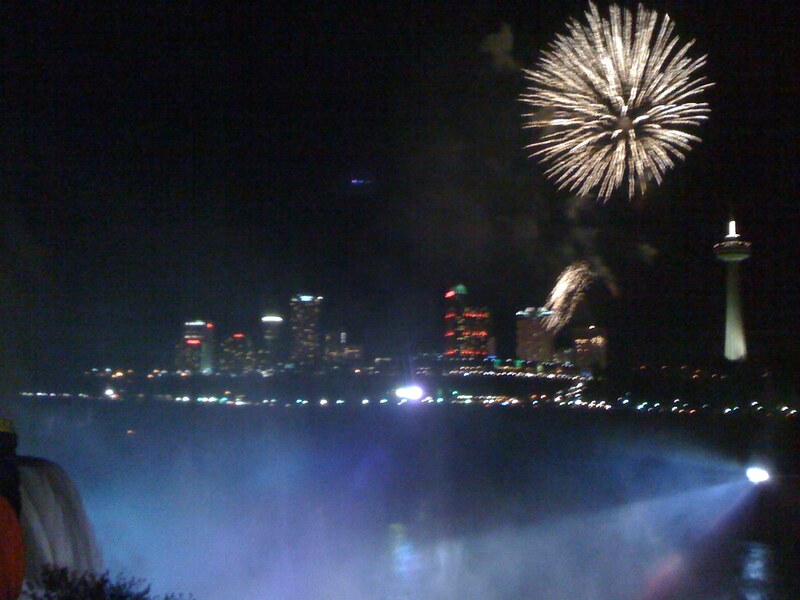 The US is the top destination among places to travel and Niagara Falls is the most popular tourist place in the USA.